Secure pictures in frames or screens in windows the easy way with affordable Brass Plated Turn Buttons! 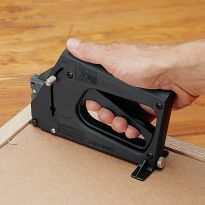 These hard-to-find items are ideal for holding backing boards or the picture itself in place in its frame bed. And if you ever want to remove the picture or screen, simply loosen the screw and turn the button for a quick release. 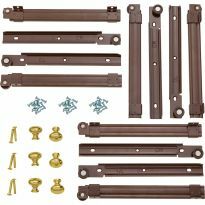 Each button is plated with brass for durability and comes with 3/8" long screws for easy installation. Pre-drilling is advised. I used these on a picture frame for my wife's cousins birthday present. 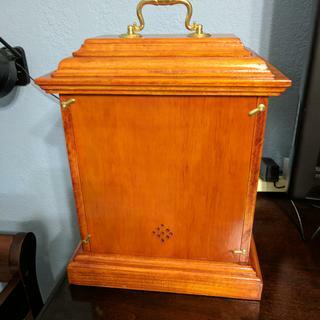 The frame is mahogany, and the turn buttons look just as good as they work. I have been looking all over to try and find these buttons for picture frames and I am glad I found them on your site. Thank you. These turn buttons worked perfectly for my application. In this case, a tiny bit "small" was better than a tiny bit "large". The brass buttons are excellent and finished out me picture frames for Christmas beautifully. Do just what they are designed for. 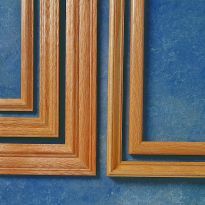 Used these for a frame I constructed out of Mahogany to hold in the photo and glass. When no local stores had brass buttons, Rockler had them. They worked great. For my needs the screws were too fine but they are great for picture backs. I used it for a bird house trap door. Worked well for holding backing for pictureframe. What's there to say about turn buttons. I like the size. I had a couple of mirrors I wanted to mount in some weathered cypress wood frames I made. These worked perfectly. Several people mentioned problems with the screws, I didn't experience that. I drilled 1/16" pilot holes and used a #00 Phillips Head screwdriver that had a "turn cap" on top so that I could put one finger there to provide downward pressure while putting the screws in. They all went in without stripping, and hold great. I used these brass turn buttons to help hold glass panels inside a curio cabinet. They worked perfectly and looked nice and finished as well. I used these to hold a frame to a mirror. These nicely slipped in bottom channel of the mirror and holds the bottom of frame firmly against mirror. I had to route slots to back of frame to make them fit. but they hold good and screws securely held turn button in place. I make picture frames for puzzles and pictures and these turn buttons work perfect for holding them in the frame but still allows me to remove them if needed. They work great when framing pictures. These were exactly what I needed. The small brass screws are tough to work with but that's to be expected. Great purchase. I am building picture frames that hold 5"X7" pictures. The turn buttons worked perfectly for this application. After looking for turn buttons at Hobby Lobby and Michaels without success, I was very pleased to find exactly what I needed at Rockler. These turnbuttons worked great for me. I made a set of picture frames out of oak &amp; cherry for my nieces wedding. I used a 1/16&quot; drill bit to make a pilot hole. I had no problem tightening the screws with the proper hand screwdriver. The only problem that I ran into was that 2 of the packages only had 7 buttons. I called my local store to see if they had any in stock. The manager took care of me at the store and replaced them without any charge. Thanks Rockler for have such great products and great customer service. I am building frames for puzzles that my wife is putting together. I have used them before for making frames for mirrors, which I sandblasted logo's...they work great. YES, you must predrill the holes (or plan on striping the screws. You might not have to predrill on soft wood, but I would play it safe! 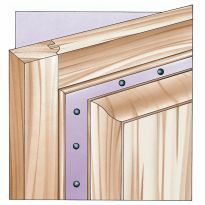 You can't go wrong(unless you oversize the drill) make sure you use the right screw. Twenty years ago we installed our window screens upside down. The screens fell out with windy weather. My wife finally said &quot;Please do something to fix this.&quot; I used this product to secure the screen. The screen has not fallen out yet and the product was easy to install. Very good quality. Solid brass and screws too, but at 50 cents each it's bit too much. These tabs are perfect for why you need them. However, the tiny screws, even with pilot holes and appropriate micro-sized Phillips head will still strip on you periodically. This has left me with 2-3 unusable screws/tabs and can be angering as there is now room for error (no extra pieces) in these packs. Look really good on my clock. Screws are really easily stripped. Don't know if that's a product issue or just common with brass screws though. I have Ceramic picture frame that the old turn buttons broke off. I was able to use these to repair the frame. Predrilling for the screws was a must and a very small phillips bit with a steady finger on the drill trigger kept from stripping all but 1 of the 8 screws. They seem very sturdy and my wife likes the look. I have been looking for these for quite a while for a pre-World War II frame. They work great. The screws are soft (i.e. brass) and small but a simple pre-drill and proper screw driver (messed up the first) and they drove home well. My package did have on extra screw so all is good. As turn buttons go, they are exactly as you would expect. They do what they are supposed to do. My only complaint would be the screws provided. Even pilot drilling and driving by hand, these screws tend to strip out. I had one screw that stripped so bad before it was seated that I had to back it out with vice grips. Since they send the exact number of screws needed (not unusual), I was unable to use one of my turn buttons. If you're patient and careful, these work great though. This was the hardware I needed for a large photo Exhibit. I have some concerns about the product cancer warning. I would be happy to spend more for a cancer free product. The turbuttons work exactly as turnbuttons should. They can be mounted nice and flush to hold things into a picture frame, etc. 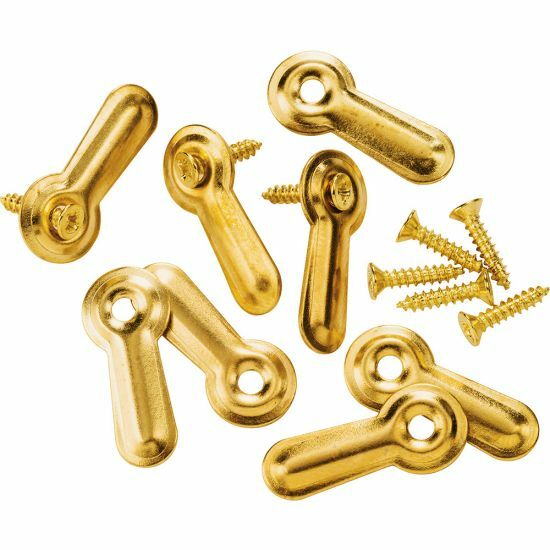 But the usual problem with "cheap" brass screws exists. Get that pilot hole just right and first run in something made of steel to cut some threads. The Philips head on these screws just wasn't that well defined and so things got a little bit dicey during installation. Turn Buttons worked great. The screws on the other hand well not so well. Three screws stripped even with pilot drilling. I had planned to use these to secure a mirror in a frame I built. But they seemed too weak. I bought some others and painted them to match the cherry wood. These were small and not suitable for the storm window application that I need . They are thin gauge and seemed cheap and not durable at all. 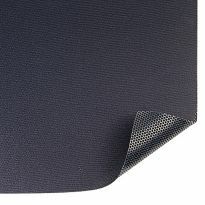 May be suitable for on interior or photograph frame type of retention system. These turn buttons are too flimsy. 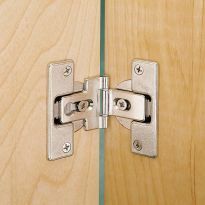 the metal will not hold glass or other inserts tightly into a frame without bending. The metal should be considerably thicker. They were unworkable, for me. The phillips slots were too shallow and the screws too soft and I had no success in getting the screws into 1/4 sawn white oak without stripping them. Since I was making gift picture frames that people would have remove the back of in order to change photos, it would have been impossible for them to accomplish that. I even drilled two size holes, larger at the top and smaller at the bottom and struggled to get these in. Too small and fragile for wood frame window screens. 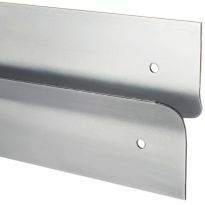 Although good for small applications these are no good for heavier applications. I am making the martin bird house, in the Woodsmith Guild Edition Magazine. I'd tell you - but not after demanding my phone no.! You already had my email to communicate. Your greed shows. Had to hold the back on a clock, and this is what the plans showed. I've been looking for these to hold paintings in frames. The thickness of the canvas is the same size as the rabbet of the frame, so these should do the job. They look like something I was looking for to put in back of my picture frames that the little tabs fell off but the frames are still good. Simple to apply and very professional finish. I have a need to turn something. Probably psychological disorder. You had them and I needed them. Good for holding clock backs on with quartz movements where battery access is easier for future maintenance. Can't get at stores in my town. they work great on my picture frames. I needed these for a high boy dresser I am working on. Can't find these anywhere else. Necessary for the picture frames I make. These are an essential part of the picture frames I make. I make hand made Mission style picture frames for presents. These brass buttons along with brass hangers, set these frames off from being ordinary. First time working with these picture frame clips. They have work well in the past. Needed for picture frame project. 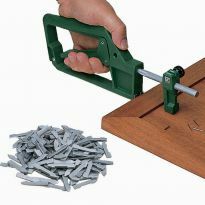 trying new products for my framing business thought would be easier than using nails and clips that bend all the time. 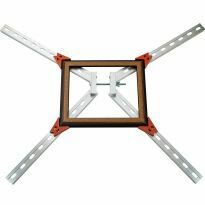 Needed for custom picture frames that I build. Want to know if the turn button is bendable? Needed for 2 pieces of glass in a picture frame but glass will be slightly higher than the frame. Was told to use a bent turn button. BEST ANSWER: It could work but there isnt a lot of room to work with to make a bend in. I think there are actually buttons that already have a bend in for this type of application but not sure where I have seen them. Hope this helps. I have not attempted to bend the brass turn buttons, but I think they could be "slightly" bent successfully (maybe 1-eighth inch or less). You can bend them with long nose pliers. They will break if you bend more than a couple/few times. They should work for that application. They do bend slightly without sacrificing strength. They shouldn't be bent more than 1/16". Better if not bent at all. Would these be able to hold a 10lb mirror in a wooden frame? BEST ANSWER: If you intend to hang the mirror and frame on a wall like a picture, and intend to use these behind the mirror, I would expect that they would work. I have used them behind large glass panels in a frame (for photos), but not for a 10 lb pane of glass, so take my opinion with a grain of salt. These were a little lighter than I had anticipated. I used them to hold a panel on the rear of a project with no weight associated with it. I would think so. You will likely want to use all (8) that are included. What is the screw size? BEST ANSWER: #3 x 3/8"